A while back, Miss Cherry Bubbles tagged me to post a picture of the "real me." I was racking my brain, thinking of what kind of a picture would embody the real me. 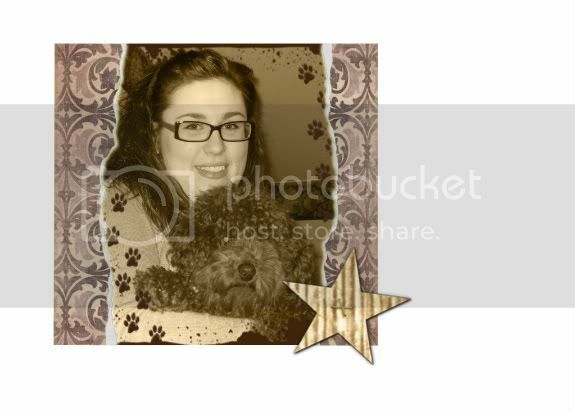 I finally decided on taking a picture with my sweet little doggie, Pumpkin. Ever since I knew what a dog was, I wanted one. After living twenty-one years without a puppy (I am living at home while attending college), my parents finally caved in and got me one. She is the best little doggie in the whole world!! :) In a way, I am sort of glad my parents had me wait because I really do appreciate her whereas I think if I were younger the novelty would have certainly worn off by now. Other than my love for my little puppy, here are some other things that make up the "real me." I am always late or running late. I have a very hard time getting places on time, but I have been getting better. I spend way too much money and am addicted to online shopping, primarily eBay. Who doesn't love getting packages in the mail?? And, lastly, I am completely obsessed with movies, mostly Classical Hollywood. I pretty much watch a movie a day, whether it is for school or for enjoyment...sometimes both! Instead of tagging people, I will open this tag up to any of my readers that feel inclined to do a post on the real me. I also want to put the word out to all my fellow Michiganders that Saturday, March 20th there will be a jewelry and vintage apparel show in Bloomfield Hills at the Birmingham Unitarian Church. It's only $5 to get in and the one day show is open from 10 a.m. to 5 p.m. Check out the website for more information. I can't wait!!!!! That sale looks fabulous - wish I lived closer to your neck of the woods! I agree with Miss CherryBubbles...the sale looks like it would be fun to attend. I hope you do a blog about it and have some pictures to show us. Very sweet picture of you and Pumpkin!! You sure find some great deals on ebay...I don't look as I think I could spend WAY too much!! Plus I like to touch and see the stuff I'm buying..